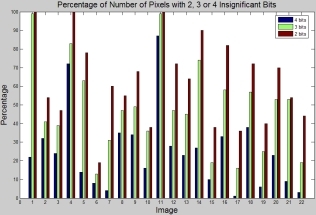 Despite the remarkable advancement in processing speed of conventional computers, the processing power of these conventional computers do not satisfy the demand for high throughput rates of data-intensive computer vision applications. On the other hand, application specific integrated circuits (ASIC) can be designed to solve the processing speed concerns for any particular computer vision applications; however, these ASIC devices are not very flexible that they can be used to support a variety of computer vision algorithms. In this project, we attempt to design a massively parallel architecture that will combine the high processing speed of an ASIC device and the flexibility of a general purpose processor. The parallel architecture design can achieve much higher processing rates than conventional computers because they exploit inherent parallelism – the ability to carry out many operations simultaneously – in computer vision applications. The designed architecture is expected to process high-resolution images (typically 2 Mpixels) in real-time (at least 30 frames per second). Some of the applications that would be supported by the designed architectures are developed within the laboratory and those applications include image enhancement, skin extraction, face detection, face tracking and face recognition. 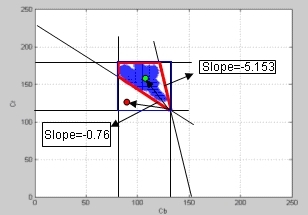 A high performance digital architecture for the implementation of a nonlinear image enhancement technique is designed an implemented in FPGA environment. The image enhancement is based on an illuminance-reflectance model which improves the visual quality of digital images and video captured under insufficient or non-uniform lighting conditions. The algorithm contains a large number of complex computations and thus it requires specialized hardware implementation for real-time applications. Systolic, pipelined and parallel design techniques are utilized effectively in a FPGA-based architecture design to achieve real-time performance. Estimation techniques are introduced in the hardware algorithmic design to achieve high throughput. The video enhancement system is implemented using Xilinx’s multimedia development board that contains a VirtexII-X2000 FPGA and it is capable of processing approximately 63 Mega-pixels (Mpixels) per second. An efficient design for the high performance, power-aware architecture to extract skin-like regions in the video stream is presented. Skin segmentation is an important step in many image processing and computer vision applications such as face detection and hand gesture recognition. The design utilizes the high correlation and similarity of neighboring pixels in video streams to reduce switching activity (hence reducing dynamic power dissipation) in the arithmetic unit. 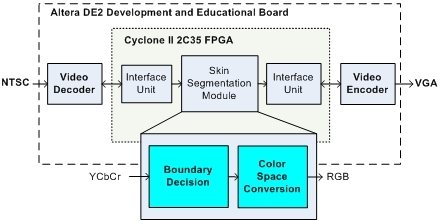 The proposed design is implemented and fitted in the Altera’s Cyclone II FPGA which is available in the DE2 development and educational board. The pipelined system is capable of performing the skin segmentation procedure in real-time with a processing rate of 654 frames per second for video frames with standard size of 640×480. It is observed that the proposed design helps to reduce operations and switching activities in the processing unit up to 42 percent which results in lower dynamic power dissipation with low hardware overhead.